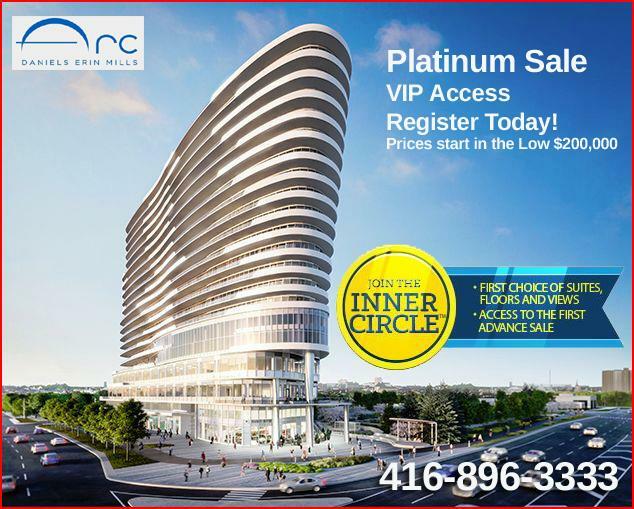 Arc Condominiums in Erin Mills will be built at the corner of Erin Mills Parkway, just a short walk from the recently updated Erin Mills Town Centre Shopping Mapp, The iconic landmark will provide a Ship like anchor to the community. Three buildings will share the exclusive space sharing an outdoor courtyard, garden plots, running track and more. Look and Feel: The look of the luxury cruise ship will provide a unique element to the skyline. It will add a lot of character to the community. With 15,000 sqft of retain sace and two floors (or 50,000 square feet) of office space, people will be able to work, shop and play right at home. Prices: The prices at the Arc will also allow first time buyers and investors affordability and luxury. With the low entry level prices starting in the low $200,000, we should expect generous value increases by the time of occupancy in 2018. They always say buy Location, Location, Location - the area is an investors dream. Sample some of the Arc Condominium Floor Plans. Design, features and finishes: 9' ceilings, laminte flooring, quartz countertops, custom-designed cabinetry with soft-close drawers and of course, stainless steel appliances. Interior design company HOK provided the inspiration for the uniquely-shaped suites bringing a luxury feel to the units. Price Lists provided are for the VIP Agent Sale - Inventory and prices are subject to change with daily sales and updates. Register for front of the line access to the best layouts, prices and exposures.